I don't think it's a secret that I am Pioneer Woman obsessed! She's hilarious and no matter what recipe I try from her, they always turn out perfect and uber delicious. But what I love most about her recipes are that they are no muss, no fuss. Simple, not too complicated and homey (if that's a word). 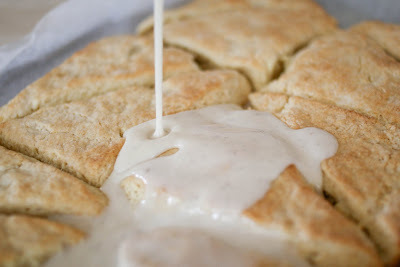 Well when I saw her recipe for these scones on her page, I most literally moaned out loud. 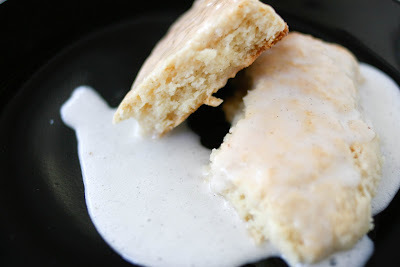 I loveeeeee the Vanilla Bean Scones from Starbucks, which is surprising because I don't like scones all that much in general. Basically these scones are the bomb (throw back to the '90s). They are flaky, easy to make, and so deliciously moist, which is quite unheard of for a scone. The vanilla bean gives off this knee-wobbling aroma that just reminds me of cuddly bears and warm laundry. Please make these, you really won't be sorry! Preheat oven to 350 F. Line a baking sheet with parchment paper, set aside. Split the vanilla beans down the middle and scrape out all the "caviar" inside. 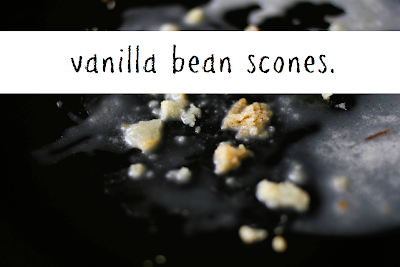 Stir into the cream, add the bean halves and set aside for 15 minutes. Sift together the flour, sugar, baking powder and salt. Cut the cold butter into small pieces, toss into the flour, and use a pastry cutter or fork to cut the butter into the flour until the mixture resembles crumbs. Mix the vanilla cream with the egg, then combine with the flour mixture. Stir gently with a fork until the mixture comes together, using more heavy cream if needed. Turn the dough onto a floured surface and lightly press together until it forms a rough rectangle (mixture will be pretty crumbly). Use a rolling pin to roll into a rectangle about 1/2 - 3/4 inch thick. Using your hands to help form them if necessary. Use a knife to cut into 6 even squares. 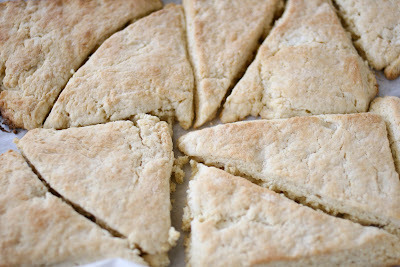 If you want large scones, cut these squares diagonally to make triangles. 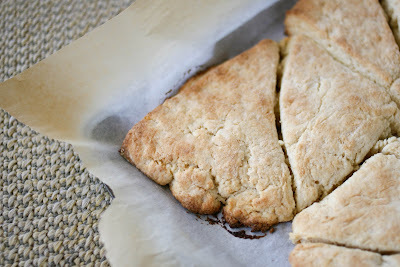 If you want petite scones, cut each square cross wise twice to make 4 pieces each (24 total). Transfer to the prepared baking sheet and bake for 15 - 18 minutes or until golden brown. Allow to cool for 15 minutes on the cookie sheet, then transfer to a cooling rack to cool completely. For the glaze. Split the vanilla bean in half lengthwise and scrape out the caviar. Stir the caviar into the milk and allow to sit for a while. Mix the powdered sugar with the vanilla milk, adding more powdered sugar or milk if necessary to get the consistency the right thickness. Stir or whisk until completely smooth. oh, Michelle these scones looks fantastic. And I heart scones. I've been playing with a gluten free recipe but haven't been that successful...yet. Soooo pretty! Only you can make scones look so good! Well done. The drizzle is a nice touch. Scones are on the menu here often. A favourite. Beautiful scones! I've gotta try this!